Very well done. Looks fantastic!!!! This cake looks awesome! Can I ask if it's sculpted or did you use RCT for the 'face'? Thanks! This one is entirely sculpted cake. I carved the basic structural shape from a sturdy (but tasty) pound cake and covered in crusting buttercream and left it to "harden" overnight. Then the details are all added in fondant. 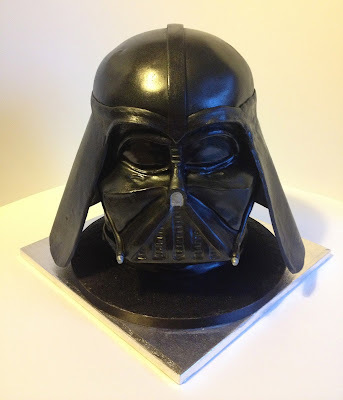 The hardest part of this cake was the helmet 'skirt'. Hi Priya. I probably could, but I am actually having a problem with my right arm at the moment, and so am not able to make cakes for a while. When were you needing the tutorial for? My arm has only recently, finally improved (though still not 100%). 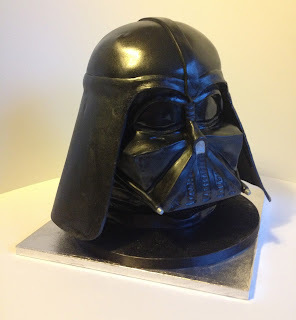 I may do a tutorial for this cake at some point, I'll just have to see where I can fit it in! As soon as I do do it however, I will post the link on this blog post, and I'd be happy to email you too. How did you make the helmet skirt? Hi Rosanna. I cut the shape out of gum paste, then wrapped it around a polystyrene form (the right size for the top of the skirt - where it attaches to the helmet), resting the bottom of the skirt on the counter top and carefully adjusting it so that it curved neatly. I kept it on a piece of parchment paper, making it easier to handle, and allowing me to pin the top of the skirt to the polystyrene form. I then left it to set for about two days, peeled the parchment paper off, and left it for a further two days. When I carved and covered the cake, I measured very, very carefully to make sure the skirt would fit snugly. When finally putting the skirt in place, I rested it on some spice boxes (you can see that in the photo with my daughter, above) and attached it to the cake with royal icing and a strip of fondant (which I then blended carefully in). I sprayed the back of the cake and inside of the skirt black before attaching it - but leaving the attachment points I sprayed, as that would weaken the join. I made sure that this was done a good 24 hours before the cake was collected, and put the spice boxes back under the skirt for transport.